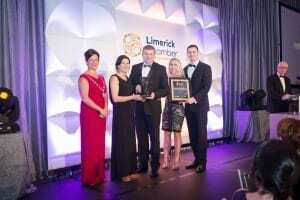 Masterchefs Hospitality have been named ‘Best Retail & Hospitality Business’ 2018 at the Limerick Chamber Regional Business Awards​​ – ​designed to showcase the region’s finest businesses and acknowledge their innovation and commitment – ​which took place at the Limerick’s Strand Hotel on Friday evening. Masterchefs Hospitality’s portfolio ranges from their ​Copia Green​ and ​Cafe Noir​ eateries to contract catering at the likes of ​Thomond Park​​, University of Limerick, NUI Galway and the HSE, event catering at the 2018 Ploughing Championships, weddings, corporate and outdoor catering. Reacting to the award win, Pat O’Sullivan, Managing Director of Masterchefs Hospitality said,​ “Winning the 2018 Best Retail & Hospitality Award is the icing on the cake for what has been a phenomenal year for Masterchefs. It is a huge endorsement for the way we have innovated and driven the company forward over the last five years with clear goals and objectives. I am grateful for the enormous commitment from every member of our team, striving to be the best and continuing to build the Masterchefs brand”. Friday night’s accolade is the company’s third high profile award win in a matter of months with Masterchefs Hospitality having also been named ​‘Best Event Caterer’ at the 2018 Gold Medal Awards ​​in late September – ​the catering industry’s most sought after award​ – and ‘Best Catering Job’ at the 2018 National Hospitality Awards (NHA)​​ in mid October – ​the pre-eminent pan industry awards for the Irish hospitality sector​.